Agent Carter is one of the expanding line of Marvel shows on TV and streaming lately. It passed me by when it came out last year, but I saw a mention of it recently in an article and decided to check out the show. I had fairly low expectations because both the Agents of Shield and Daredevil shows had lost my attention during their first seasons. Agent Carter blows them out of the water. 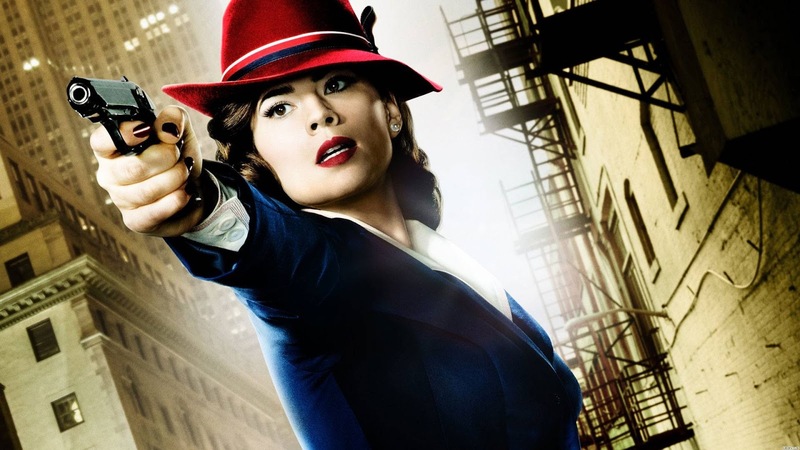 It's set just after World War II and it follows Agent Carter, the woman who was Captain America's liaison and love interest during Captain America: The First Avenger. It deals with post-war events, being a woman in that time period, being an agent of the U.S. government, Howard Stark, and so much more. The basic premise to kick off the season is that Howard Stark had a bunch of inventions stolen and the agency that Carter works for is trying to find them and get them back. One of my favorite parts about the show is that it's all about humans in a world that has had superheroes like Captain America. Coming back to the human level of everyday life in this sort of world is so fascinating. Things don't have to be larger than life and so... superheroey all the time. It makes for an excellent show. Not to mention that the first season is 8 episodes. I'm finding that I like shorter seasons of shows more and more. They tell their story, move their plot along, and then wrap up. They don't have to drag out over the typical 22 episode season. That means there are no bad or filler episodes. They're just all good. Agent Carter has actually reinvigorated me for Marvel shows in a way I didn't know was possible. I think I'm going to go back and give Daredevil and Agents of Shield another shot. But before I do that I want to rewatch Captain American: The First Avenger. I haven't seen it since it was in theaters but after Agent Carter I really want to check it out again. I honestly want to see it more for Agent Carter's origin story than for Captain America's. I really enjoyed it. Plus -- Hayley Atwell, Bridget Regan, and Lyndsey Fonseca all in the same show? SIGN ME UP!!!!!! I'm going to be honest... I'm horrible with actors and actresses names. I have no idea who any of those people are. But I loved this show. I'm super excited for season 2! Hayley Atwell = Carter. I've never seen her in anything else, but she does this so well, I'm perfectly fine with that. Plus she was at the Salt Lake Comic Con a couple of weeks back and was just wonderful in-person too, so I'm a definite fan of hers. Bridget Regan -- The next-door neighbor turned assassin. I 1st saw her in the (abominable) Legend of the Seeker tv show and something about her just "did it" for me, so I've watched that entire show in spite of how bad it was, just so I could see her in it. She was also a long-term recurring role in White Collar for the 5th season, and currently has a recurring role in my wife's favorite show -- Jane the Virgin. She still "does it" for me in everything I've seen her in. Lyndsey Fonseca -- the waitress friend who got her into the dorm and then moved to Stark's place with her. She was the daughter in "How I Met Your Mother," had a small part in Hot Tub Time Machine, and was one of the 3 main characters in the tv show Nikita. I haven't seen all of Nikita, but the 2 or 3 seasons I did see she was simply gorgeous and quite good in, so... I like her a lot. Combine all 3 into 1 show now, and as I shouted before: SIGN ME UP!!!!!! I want to enjoy the Marvel Universe and all that they have been putting out for the last decade and a half... I was a Marvel Comics kid after all, so many of the characters have held a long term place in my nerdy heart. However, my favorite character of all time, Spider-Man hasn't gotten much love in his big screen renditions. They were alright, but not great. Same goes for X-men, and I basically stopped watching those movies after they became horrible. Other characters I didn't care for I skipped over. Really the last two I enjoyed were Avengers and Guardians of the Galaxy. TV shows about subset characters aren't going to hook me I don't think. I didn't care for Daredevil, though I didn't like the movie either. I just think they've lost the magic of the comics somewhere in the translation and I can't get into them anymore. It's sad, but true. That's interesting, because I was never into the comics as a kid and now I'm loving what they're doing. The main thing for me has been to watch the shows and movies that Disney is producing with the Marvel brand. All the Fox Marvel movies are pretty bad. Fox is still in charge of Spider-Man, X-Men, Fantastic Four, and I think a couple others. It looks like Disney is slowly gaining the rights back, so I hope that they start to produce good content for them soon. I don't think there's actually a superhero in it at all. It's just set in that world. I highly recommend it. Let me know what you think if you watch it!